From way back in the 1960s, this still very useful cup was made for Alka-Seltzer! The little fellow in the logo was Speedy. This collapsible travel cup is great for a tote, a purse, pocket or glove box. It folds down to 2-3/8 inches in diameter by 1 inch high. It opens to just about 3-inches tall. 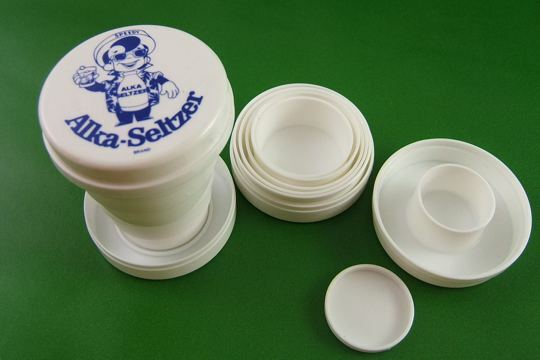 The lid contains a small covered compartment to hold 2 fizzy Alka-Seltzer tablets or other pills. 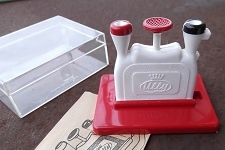 This is old store stock that was originally a give-away with the purchase of a box of Alka-Seltzer. The cup is very collectible, but, because it is in pristine condition, we're sure you could use it for its original purpose! Two cups shown for illustration only.